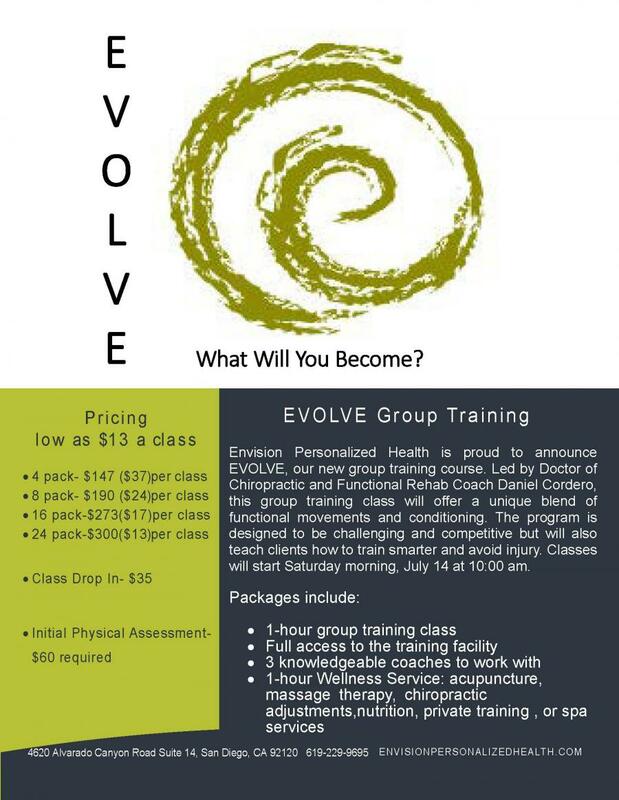 Envision Personalized Health is proud to announce EVOLVE, our new group training course. Led by Doctor of Chiropractic and Functional Rehab Specialist Daniel Cordero, this group training class will offer a unique blend of functional movements and conditioning. The program is designed to be challenging and competitive, but will also teach clients how to train smarter and avoid injury. Our initial physical assessment will help our coaches determine how to best work with each individual client. Working alongside Dr. Daniel are two of our Personal Trainers at Envision, Ben Woods and Mike Edwards. Each group class will have a unique mix of functional movements, stretching, strength training, cardio conditioning, and HIIT workouts. Evolve clients will have full access to our facility, including our workout space, kitchen, changing rooms and showers. Included with our group training packages: 1 hour of *Wellness Services, and additional workshops at a group discount rate. #personal training, #nutrition, #acupuncture, #massage therapy, #chiropractic adjustments, and #spa services. We look forward to working with each one of you!